Zenith model 835. This is the top of the line tombstone for 1935. And the top of the line of the chrome grille models. 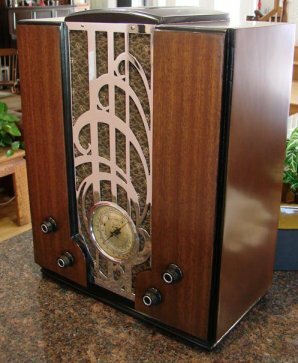 Zenith only made 3 chrome grille radios and this is the Holly Grail of them all. It sports 10 tubes and a 10" speaker. It has a big sound just like a console of the time. As you can see in this web page I have the complete set of 3 chrome grilles. 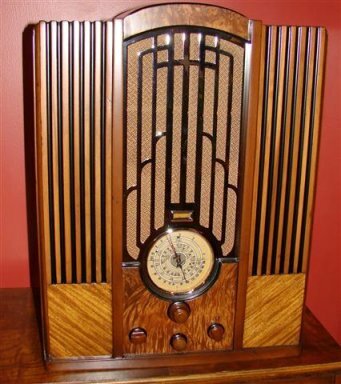 Zenith model 829 is a 7 tube radio. This is the middle of the chrome grille model tombstones for 1935. I think this is the nicest looking grille of the 3 radios. This radio still has it's original grille cloth. Reproduction cloth for this model is not available. This Zenith model 809 from 1935 is the baby of 3 chrome grille models made. The 809 is the smallest one with only 6 tubes. The Zenith chrome models are highly sought after. I found this one in a swap meet in a area between Laughlin Nevada and Kingman Arizona. I about flipped.... The dealer wanted $30. He said a tube was broken and his friend got shocked. I looked at it and the rectifier #80 tube was broken. I said yes I can see why. With a broken tube I said it must be only worth $25. He said "yeah you are right" and excepted $25.00. Of course, the radio did not look like this when I purchased it. It needed full restoration. The grille needed to be re-chromed as well. The grille cloth was a rose pattern. Most likely from a curtain.